This one, which came out for the 2015 Winter Hello! Cons, would be Berryz' last as well as Country Girls' first. It also pre-dates Kobushi Factory, who were announced at that Hello! Con itself. Thus, in addition to the usual questionnaires, it's supplemented with a Berryz Kobo special as well as a new members special (MM 12ki, S/mileage 3ki, the 5 new Country Girls). Q5. Please give a comment to a member, something you can say BECAUSE you're good friends with that girl. Tsugunaga Momoko: Tokunaga Chinami-san, we're already proper grown-ups, so let's take this opportunity to stop with pranks like putting ice in each others' shoes. Tokunaga Chinami: Maimi, thank you for everything. Although I thought that we understood everything about one another since we're alllllllways together, I just found out the other day that Maimi enjoys and is good at making sweets (lol). Nakajima Saki: ℃-ute-san, thank you for being together with someone like me. Okai Chisato: Recently, (Suzuki) Airi's flow has been really amusing ♥ In 2014, my liking of Airi has gone up! Hagiwara Mai: Airi! I love Airi's atmosphere (laughs). She's fun. Suzuki Kanon: To Nakanishi Kana-chan. We often hang out together, but when we're thinking about what to do, you often show consideration by going 'Whatever's fine~♪', it occasionally makes me worried. Iikubo Haruna: Kuduu, Kudo Haruka-chan. She always lets me pamper her, she's like a little sister (brother?) to me. If I recommend a game to her, she'd obediently install and play it, but she gets even more into it than I do. But seeing her recently, when we're working, she says she likes manga, I wish she would quit hiding her character (laughs). Sato Masaki: To Oda-chan. Hang out a bit more with Maachan---↑↑ (lol). Ogata Haruna: Makino-chan. Despite being younger, you're the most level-headed person in 12ki, thank you for leading everyone. I always think that I've got to become level-headed soon. Nonaka Miki: Ogata Haachin! Even though you're older than me, you're easy to get along with and you're funny, I love you!! Thank you for everything. Haga Akane: To Aikawa Maho-chan. Maho changed since she became a 3rd gen member of ANGERME-san (laughs). But I like that Maho too ♥ I really get along with Maho, she's an awesome kouhai! Nakanishi Kana: I love Takeuchi Akari-chan!! Love her------!! Takeuchi Akari: Mizuki-chan!! You mistake people's names with character's names too often! Katsuta Rina: Zukki and Ayumi who said that they'd come and watch 'Smile Fantasy' but didn't (laughs). Tamura Meimi: My contemporary Kananan!!! Even though I always call her 'Idiot!' (laughs), I actually love you. Murota Mizuki: Makino Maria-chan. I like how she's always smiling! You often trip, so be careful okay. Aikawa Maho: Haga Akane-chan. She;d always talk to me with a 'Maho-', plopping down next to me when I'm alone. She's really cute. Even though she's my senpai, she's like my younger sister, I like how friendly she is! Kanazawa Tomoko: Uemura Akari-chan, the mole at the back of your hand is cute, I like it...... That's all (laughs). Takagi Sayuki: Kudo Haruka! Sorry that there was a bit of a wall created between us during the summer Hello! Cons, Despite that, you got in touch with me when I was in a pinch, I'm really grateful. Thank you. Love yo-----u! Uemura Akari: Murota Mizuki-chan always does something in funny in front of my eyes that makes me laugh. But personally I like the way she laughs. Yamaki Risa: I never thought that we'd become this close when we first met (laughs). Thank you for always contacting me! From now on as well, please soothe me with your cute voice that I could never make in my life. Inaba Manaka-chan. Ozeki Mai: (Shimamura) Uta-chan! Thank you for going around together with the always noisy Mai!! Chiitan gave a non-specific answer, which is why she's all by herself in the diagram. Nacky and Yuka picked their respective groups, while Sayashi chose her fellow 9th gen. Only other person to single out more than one person was Bakuwara. Country Girls were fairly new, and mainly picked from their ranks. Only Momochi chose someone not in Country Girls, though technically in the same group as her. ℃-ute follows a similar trend, with Maimi's the only one who picks out someone from a different group. Berryz Kobo members picked fellow group members, ℃-ute members, or Maro. Out of their own group, the Juice=Juice girls picked out former Kenshuusei from two different groups. In that vein, ANGERME were probably the least focused on their own group for this question, with only two members picking someone out from their own group. Everyone else who wasn't Maro picked a Musume member. 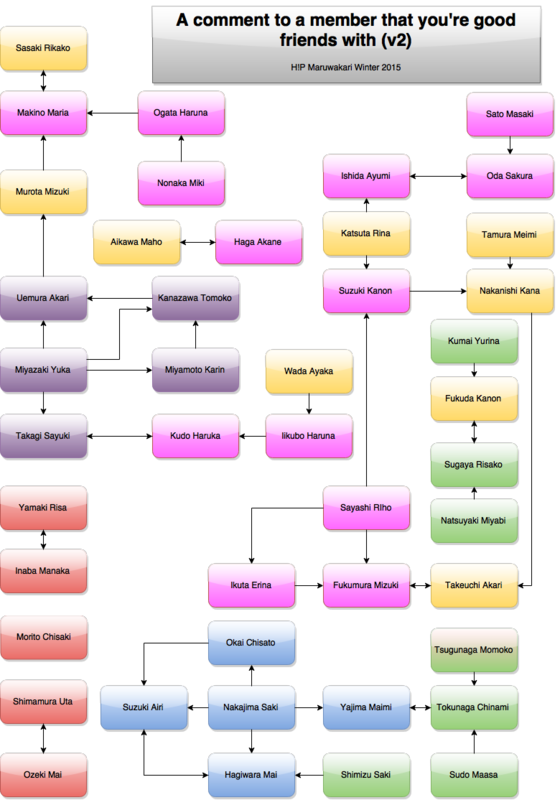 With the exception of Duu, the Morning Musume。´15 members either picked someone from their own group or from ANGERME. 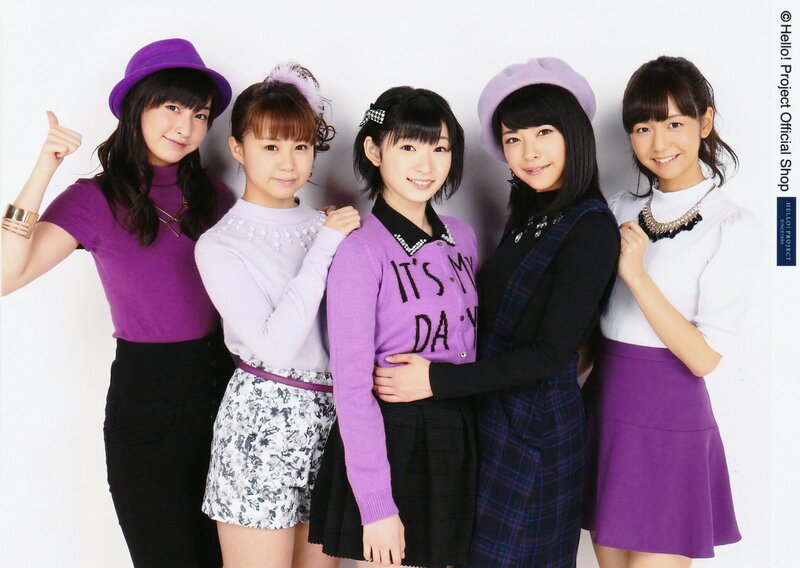 The Morning Musume。´15- ANGERME connection probably lies with them having performed the stage play 'Lilium' together. These people had at least 3 people mentioning them directly or indirectly: Airi, Maria, Mizuki, Mai, Chinami. For people who say that they aren't exactly friends, it's odd that Oda-chan and Ayumin picked one another. Other mutual choices include: Rikako-Maria, AiAi-Haga, Takagi-Kudo, Yamaki-Inaba, Uta-Ozeki, Airi-Mai, Maimi-Chii, Maro-Riro, Take-Mizuki. 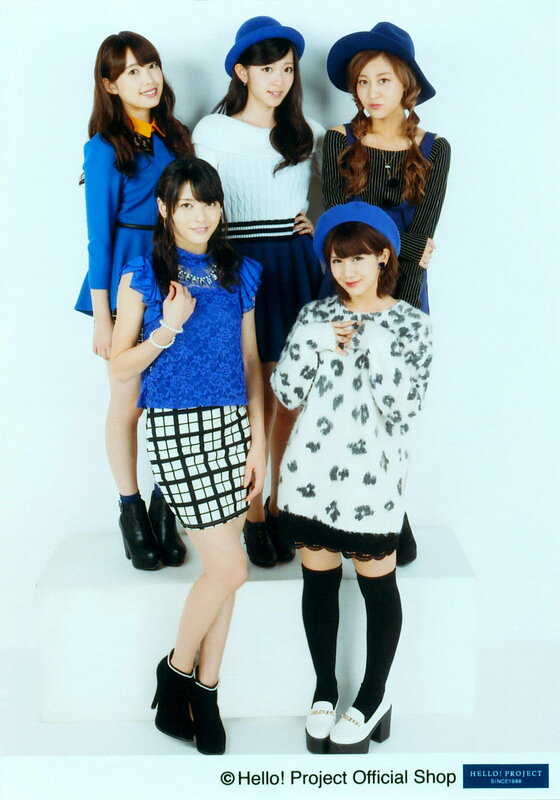 I'm not sure I've seen another Berryz group shot that so accentuates Yurina's height. Very interesting! Nice to read, thank you!